Cubans from the eastern city of Holguín defied state security forces to protest the widespread food shortages still plaguing the communist-controlled island in a video published Wednesday. The video showed street vendors defying police who tried to confiscate their food, mainly by throwing their products on the ground so that locals could pick it up and eat it. Their protest was consequently backed up by a number of passers-by, who went out to help street vendors and demanded authorities not confiscate what they had for sale. “Do not take anything, they’re killing us with hunger, this is the government of Díaz-Canel,” one could be heard saying, referring to the island’s president, Miguel Díaz-Canel. Díaz-Canel answers to the head of the Communist Party, Raúl Castro. As part of the regime’s communist vision, police are required to regularly inspect the actions of private retailers, mainly by arbitrarily imposing significant fines, confiscating products and withdrawing their licenses. Cuba began suffering severe food shortages late last year, beginning with a shortage of wheat that left Cubans with no access to the bread the government mandates they eat through rations. Some on the island are speculating that Cuba may be returning to the “Special Period” of the 1990s when the island experienced the worst economic crisis in its history following the collapse of the Soviet Union. 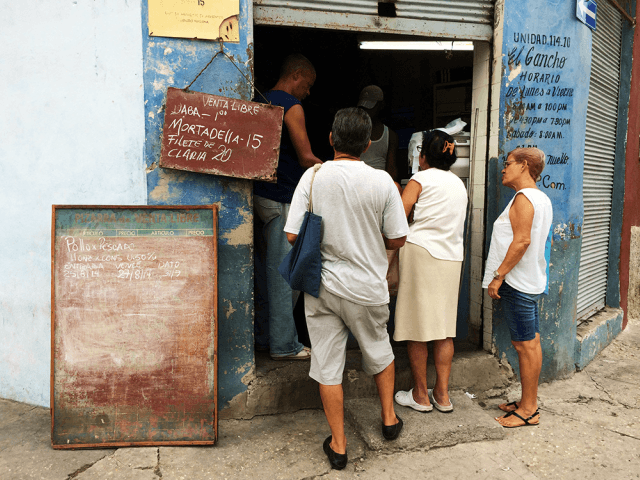 For many Cubans, products such as bread and eggs are now considered a luxury, with people forced to queue for hours to buy them from state-run stores. As noted by PanAmerican Post, one of the key reasons behind the current hunger is the regime’s failure to produce sufficient quantities of flour, the vital ingredient for producing bread. Regime officials claimed that several mills throughout the country had broken down and the government had no access to replacement parts. Havana also failed to import sufficient quantities of wheat to meet the demand from the population. Despite the regime’s failures, individuals seeking to eat are the ones suffering retribution – those found in personal possession of flour can face fines of up to 3000 pesos ($30), four times the average monthly salary. Most Cubans are forced to rely on large imports of low-quality rice, which has become the staple food of the ordinary Cuban diet. According to official figures, the average Cuban consumes five kilograms of rice per month and the country imports 400,000 tons of year. The Cuban regime has repeatedly blamed the country’s food shortages on the United States, and specifically the Trump administration rolling back the lifting of sanctions undertaken by the Obama administration over the regime’s egregious human rights violations. Last month, Díaz-Canel was quoted as blaming “the impact of the embargo, which has strengthened under the Trump administration,” for nationwide food shortages, accusing them of “financial persecution” against the island. However, the regime now plans to take advantage of their rapidly growing tourist industry by increasing taxes on private landlords of rooms and homes for foreigners. Many of the country’s current economic difficulties are also a result of the ongoing collapse of the Venezuelan economy, which has long subsidized the Cuban economy through generous oil exports in exchange for medical workers and helping develop a repressive state security apparatus.